The Deloix Aqua Centre Hotel is set in lush tropical landscaped gardens in the Rincon de Loix area of Benidorm. This spacious open plan hotel boasts impressive pool facilities for both adults and children and has a relaxed atmosphere. Anyone looking to be within easy reach of the resort centre with all its amenities will enjoy the peace and tranquillity of this friendly hotel. My wife and I stayed at the Hotel Deloix for 2 weeks in November, this was the first time I have stayed so far from town, but the benefit is you don't get high rise buildings blocking out the sun, my first time at this hotel as well. We were very pleased on arrival, very spacious inside and the rooms were great, lots of room and a big balcony. If you take young children with you they are ideal as the balcony is enclosed. The outdoor pool area was very relaxing and like I said earlier no high rise buildings spoiling sitting in the winter sun. We tried the indoor pool a few times, felt chilly though, bit better after swimming around for a bit, you have to wear a swimming cap when using the indoor pool. My only fault with the Hotel Deloix was the food. The first week the food wasn't too bad, there was always something to eat and the food was kept warm. The second week though was the worst food I've ever been served in a hotel, most nights it was cold and the choice was very poor, we even stopped eating the salad when I noticed the tongs for picking up your salad didn't have plates to put the tongs on and were put back on top of the food. If your thinking of going the the Hotel Deloix then you should try it, go room only or bed and breakfast though and go to the top notch bar just down the road. Hotel was very clean pool lovely with plenty of sun beds. rooms nice, good size bathroom with hairdryer. I would stay at this hotel again if I just went bed and breakfast for a 4 star hotel the food is dredful and the resturant staff were rude.Great bus serice right stops right outside the hotel. We travel to this hotle in June 09. I had my 2 year old son with me. We were impressed with the hotel and how clean it was. We had to cahnge rooms on the 1st day as our room didnt have air con that was working! however all credit to the hotel stff we received a much larger side view/pool view room whihc had 3 double beds in! The food was awful, nothing at all for my son to eat (no kids meals at all) and the evening meals did not start until 8pm so we were stuck in hotel until after 8:30pm every night. The staff in the resteraunt were not great they took plants away far too fast (sometimes even before we were even finished!). Hotel in quiet location if rooms to the side rather than the front with traffic noise. Very clean and staff excellent only let down food was definitely not four star. Breakfast eggs and bacon were always very greasy and not appetising.Dinner at evening a bit late 1930 start,poor presentation,poor choice,lack of carvery, most food at counter cooked from frozen with lashings of cooking oil.Ice cream and creme caramel in tubs.We were most dis-appointed with food. Waiters very quickly removed your plate and cutlery. The swimming pools and sunbathing areas were spotless and the rooms were the best I have been in Benidorm. The maids were lovely and the towels were changed everyday the food however was not four star. Food I would go as far as saying it was two star. Apart from the food everything else was brilliant and it was only a ten minute walk into Benidorm the bar staff and reception staff were lovely. Our room in the hotel was lovely, very modern and clean, and the bathroom was all you could wish for with clean towels every day. The only gripe that we had was the food, the bacon at breakfast was horrible as was the tea, take your own tea bags. The dinner choices were not very good, packet soup, and lots of fish dishes, not to my taste. The entertainment was almost non-existant, but this wasn't a problem as plenty entertainment in the resort. The hotel is a fair distance from Bernidorm town but plenty of taxis and buses. We found most of the staff very pleasant, but they do tend to whip your plate away before you're finished. I had expected the food to be better considering the reviews I had read. It was very difficult to put a meal together. The restaurant itself has no ventilation so when the chef is cooking up front the whole dining area is filled with smokey fog. They run out of sweets very quickly and didn't replinish most. It was the same thing most meals and was disappointed in a 4* they don't offer any ice cream. Breakfast was everything, bacon (very poor standard), eggs in so much fat you have to get a napkin to soak it off. The fruit was fantastic though. Take your own tea bags as the tea is a bit rank. Not great but you can get a taxi into Benidorm town but make sure you walk down to the rank as they stick about 4 euros on a single journey by picking you up from the hotel and gets a bit expensive if you're doing it a couple of times a day. Most were friendly and helpful. The outdoor pool is massive but not heated and I'm telling you it was like getting into a bath of ice cold water. It really let the hotel down. They also have a couple of small pools inside which are jet sprays. They come on every other half hour. They have 2 jacuzzis within this bit but they dont really bubble much. There is a separate part downstairs which have wierd showers etc etc, steam room and you have to PAY for the facility. You get 90 minutes maximum and you have to pay 8 euros per person per 90 minutes. In all indoor pools, jacuzzis, steam rooms etc you HAVE to wear a hat and socks (rubber ones). The hotel itself is very clean but the pool area could do with a good clean. It's a bit on the sparse side too. The bathrooms are supberb but being a bit of a traveller you do need things to make life a bit more manageable. For example. They have a mirror along the dressing table but if you sit down to do your hair then you don't reach up anywhere near the mirror (and us girls need a mirror to dry and straighten our hair). Hooks are needed on the back of bathroom door as we were three females in one room so trying to keep our towels separated from each other proved a bit difficult. It was around 25 degrees and the air conditioning is timed for the whole hotel. Now, 3 of us trying to get ready in the blazing heat, with hair dryers and straighteners going, plus showers proved a very hot room indeed. I really would have thought considering this is a brand new hotel they would have built it with air conditioning to each room rather than for the whole hotel. I don't think I would go to this hotel again but will give another one a go. The pubs in the main strip were a right laugh. Tons of stag and hen dos and divorce dos going on. It doesn't matter how old or young you are when you go as everyone seems to accept everyone. In our opinion this is the best hotel in Benidorm. Cleaned to a very high standard and staff are lovely. Rooms are big with nice sofa,fridge and well equiped bathroom. Large balcony with flowers and shrubs on each one. We also got the sun from morning till night. 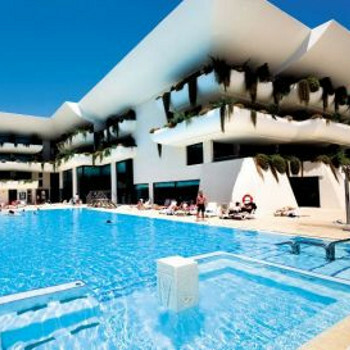 Large pool area with plenty sunbeds which are available at any time of day. It is a bit of a walk to the beach but it is a nice walk and we enjoyed it. We will definately return to this hotel. We booked this hotel independently after checking it out on line. It certainly lived up to all expectations. We decided on this out of town location because we went to see the festival so didn't want to stay in town as previously, but due to the exceptional hotel when we visit again we will stay here. buses stop right outside the hotel. everything about this hotel suited as and we will go back time and again. First visit to this hotel and although a bit further out from the centre we didn't find it a problem. The hotel itself is lovely with bright spacious rooms with good indoor and outdoor swimming pools, although at the outdoor pool they could have been doing with smaller individual umbrellas to shade under. The food was fine you were never stuck for something to eat. Overall a nice hotel and we are booked to go back in June.